This species is accepted, and its native range is Tropical Africa, W. Indian Ocean, Tropical & Subtropical Asia. 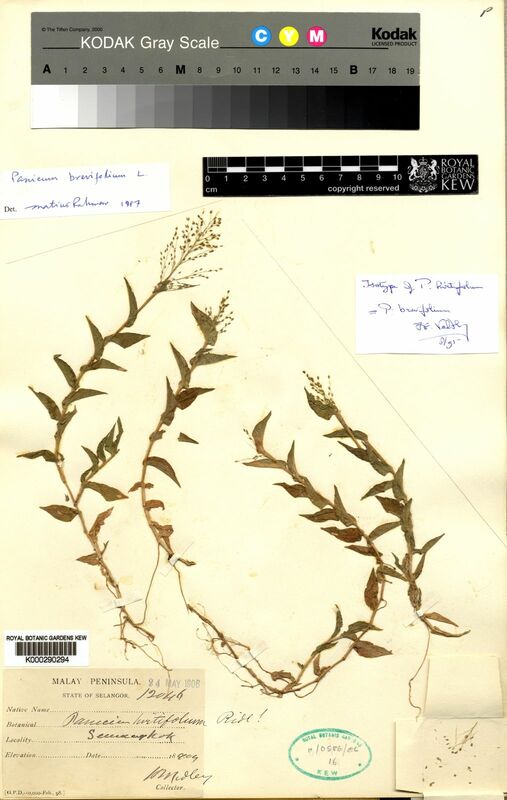 Annual; culms 15–100 cm. long, rambing, often rooting from the lower nodes. Leaf-sheaths ciliately fringed; blades narrowly ovate to ovate, 5–10 cm. long, 10–25(–38) mm. wide, amplexicaul, thin, cross-veins present, glabrous or pilose, finely acute. Panicle ovate, 5–15 cm. long, rarely more, delicately branched, the branches spreading and often appearing somewhat tangled. Spikelets ovate, 1.5(–1.8) mm. long, asymmetrical, usually sparsely puberulous to pilose, slightly apiculate; lower glume hyaline, oblong, as long as the spikelet, (1–)3-nerved, separated from the rest of the spikelet by a short swollen internode; upper glume ovate, herbaceous, 5-nerved; lower lemma 5-nerved, sterile, its palea well developed; upper lemma pale, shining. 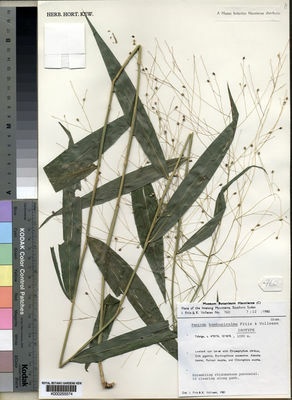 Annual; culms 15–100 cm. long, rambling, often rooting at the lower nodes. Leaf laminae 5–10 cm. long and 10–25 mm. wide, thin amplexicaul, glabrous or pilose, cross-veins present, finely acute. 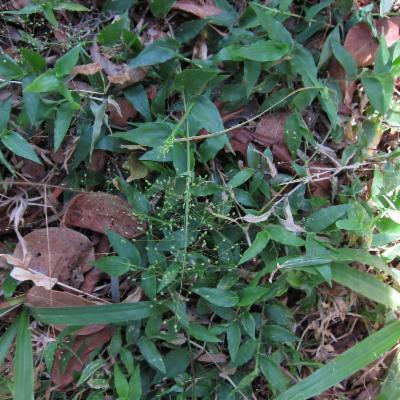 Panicle 5–15 cm. long, ovate, much-branched, the branches delicate and often appearing somewhat tangled. Spikelets 1.5–2 mm. long, ovate or ovate-elliptic, sparsely puberulous to pilose; inferior glume as long as the spikelet, 3-nerved; superior glume 5-nerved; inferior lemma 5-nerved, sterile, its palea present; superior lemma and palea pallid, glossy. Annual. Culms rambling; 15-100 cm long; rooting from lower nodes. Leaf-sheaths outer margin hairy. Ligule a ciliate membrane. Leaf-blade base amplexicaul. Leaf-blades ovate; 5-10 cm long; 10-25(-38) mm wide; membranous. Leaf-blade venation with distinct cross veins. Leaf-blade surface glabrous, or pilose. Leaf-blade apex acute. Inflorescence a panicle. Panicle open; ovate; 5-16 cm long. Primary panicle branches spreading. Panicle branches capillary; flexuous, or tangled. Spikelets solitary. Fertile spikelets pedicelled; all alike, or heteromorphic (peripheral spikelets villous). Spikelets comprising 1 basal sterile florets; 1 fertile florets; without rhachilla extension. Spikelets ovate; dorsally compressed; gibbous; acute; 1.5(-1.8) mm long; falling entire. Rhachilla internodes elongated between glumes. Glumes dissimilar; reaching apex of florets; thinner than fertile lemma. Lower glume oblong; 1 length of spikelet; hyaline; without keels; (1-)3 -veined. Lower glume surface puberulous, or pilose. Lower glume apex acute. Upper glume ovate; 1 length of spikelet; herbaceous; without keels; 5 -veined. Upper glume surface puberulous, or pilose. Upper glume apex acute. Basal sterile florets barren; with palea. Lemma of lower sterile floret similar to upper glume; ovate; 1 length of spikelet; membranous; 5 -veined; acute. Fertile lemma oblong; dorsally compressed; 1 mm long; indurate; pallid; shiny; without keel. Lemma margins involute. Lemma apex obtuse. Palea involute; indurate. Africa: west tropical, west-central tropical, northeast tropical, east tropical, southern tropical, south, and western Indian ocean. Asia-temperate: China and eastern Asia. Asia-tropical: India, Indo-China, and Malesia. South America: Brazil. Very rarely the outer spikelets of the panicle are long-hairy and apparently surrounded by a delicate halo. Perennial. Rhizomes elongated. Culms rambling, or scandent; 100-200 cm long; woody. Culm-internodes distally glabrous. Lateral branches ample. Leaf-sheaths tight; 3.5-4.5 cm long; striately veined; pilose. Ligule a ciliate membrane; 0.5-1 mm long. Leaf-blades lanceolate; 9.5-22 cm long; 19-34 mm wide; stiff. Leaf-blade midrib conspicuous. Leaf-blade venation with 6-10 secondary veins; with obscure cross veins. Leaf-blade surface glabrous. Leaf-blade apex attenuate. Inflorescence a panicle. Panicle open; globose; effuse; 22-32 cm long. Primary panicle branches spreading. Panicle branches stiff; smooth. Spikelets solitary. Fertile spikelets pedicelled. Pedicels filiform; 30-60 mm long; smooth. Spikelets comprising 1 basal sterile florets; 1 fertile florets; without rhachilla extension. Spikelets ovate; dorsally compressed; obtuse; 2.5-3 mm long; 1.4-2 mm wide; falling entire. Glumes similar; reaching apex of florets; thinner than fertile lemma. Lower glume ovate; 2.5-3 mm long; 1 length of spikelet; membranous; without keels; 9 -veined. Lower glume surface puberulous. Lower glume apex obtuse. Upper glume ovate; 2-2.5 length of adjacent fertile lemma; 1 length of spikelet; membranous; without keels; 9 -veined. Upper glume surface pubescent. Upper glume apex obtuse. Basal sterile florets barren; with palea. Lemma of lower sterile floret similar to upper glume; ovate; 2 mm long; 0.75 length of spikelet; membranous; 3-5 -veined; pubescent; obtuse. Fertile lemma ovate; dorsally compressed; 2.5 mm long; indurate; dark brown; shiny; without keel. Lemma surface smooth. Lemma margins involute. Lemma apex pubescent. Palea involute; indurate. 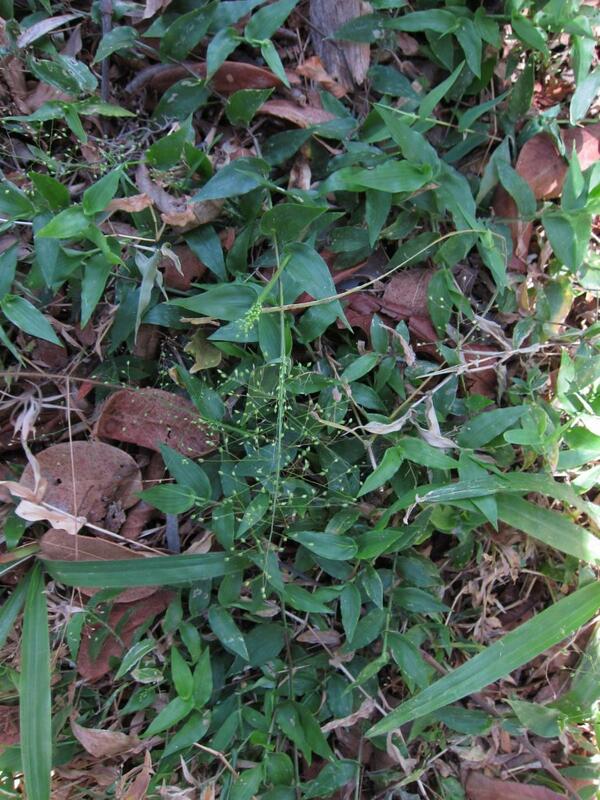 Paniceae. Fries & Voll. 2001. Panicum guineense Desv. ex Poir. Berhaut, Fl. Sén. ed. 2, 416. 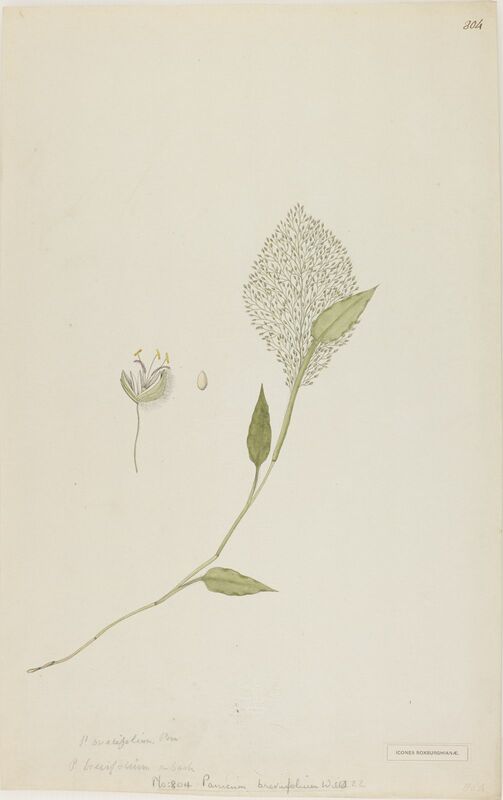 Stapf in Flora of Tropical Africa 9: 731 (1920). L., Sp. Pl. : 59 (1753).